Plantation shutters are the classic window covering that remains our most popular product. 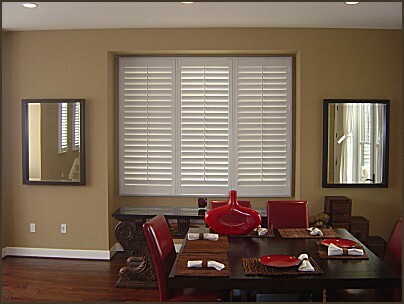 We offer both real wood and vinyl shutters in a wide array of colors, styles, and options. The timeless elegance, superior light control, added insulation value and ease of maintenance make shutters a natural choice for anyone seeking to upgrade their home or office. Plantation Shutters are much easier to clean than most window coverings. There are many options and styles to choose from. The first choice you want to make is the finish. If you want to keep the color light to match your base and/or crown moldings, you will want to choose Basswood Shutters that are painted a color that is close to the color of the trim in your home, or go with a Synthetic Shutter that only comes in a few shades of white and off white. Or maybe you like the feel of the Stained Basswood shutter, which displays the beautiful natural grain of the wood in different shades of browns, or the Sandblasted Shutter, which is painted yet shows the grain texture of the wood. White shutters have a tendency to make a smaller room look bigger, while stained shutters may make it seem closed in a bit. If the room is larger, it will not matter as much. Here are some things to consider when deciding between natural basswood or a synthetic (also known as Poly or Vinyl) material. Both materials have their benefits and limitations. Basswood is a natural product with “natural beauty”. The finish on basswood shutters tends to be a bit brighter than that of the synthetic. 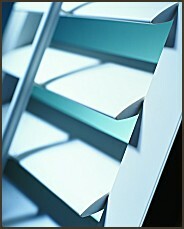 Synthetic shutters all though have come a long way. They no longer look “plastic” or fake, nor are they hallow. Wood painted shutters tends to have a “glossier” finish than synthetic. Wood is also much lighter than synthetic. Since the synthetic material is denser than the wood, it does insulate a bit more from the sun and heat. The Liberty Arch Tops option is only available on wood due to the present limitations of the synthetic material. Strength wise, the synthetic is much more durable than wood. It is scratch resistant for the most part, and can be wiped down with a wet rag when cleaning. With wood, you must be careful to keep any kind of moisture away from it. Synthetic will not “amber” with years of exposure to the sun. Wood expands and contracts with warm and cold weather, which is why the staples in the louvers sometimes become loose and pop out. Synthetic is impervious to the weather, so staples never come out. The synthetic finish is baked on rather than sprayed on. Synthetic shutter panels can now be made in the same widths as wood because of the aluminum extrusion through the louvers, stiles, and rails which dramatically reinforces its' overall strength. Lastly, wood, as we all know, is flammable. So is the finish put on it, whether its paint or stain. The synthetic material on the other hand, is actually a flame retardant. 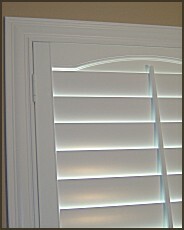 There are other options as well as upgrades to consider for both wood and synthetic shutters. Clear View Shutters removes the tilt rod from the front of the shutter, and relocates it to the back side of the panel. The “tilt” mechanism is actually attached to the side or “end” of the louvers. Ultra Clear View Shutters take it one step further by removing the tilt mechanism from the outside of the shutter all together and putting it on the inside of the shutter stiles. Both styles were designed with optimal view in mind. Another option is the Shutter With Midrails, which is when a louver is removed from the panel and replaced with a “mid rail”. 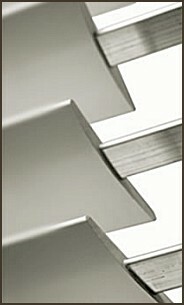 This allows the top and bottom set of louvers to operate independently. An alternative to this is the Shutter With Split Tilt Rods, which achieves the same affect without removing any of the louvers.